You believe in the ability to make superior security selections, or you don’t. You believe in the ability to time markets, or you don’t. Take a look at the diagram below: the Investment Decision Matrix. This shows how people can be classified according to how they make investing decisions. Let’s explore which investors have which belief systems, and ask where you should be with your own beliefs. Quadrant one is the noise quadrant. It’s composed of investors who believe it’s possible both to time the market and to make superior selection of securities. They think that they (or their favourite financial guru) can consistently uncover mispriced investments that will deliver market-beating returns. In addition, they believe that it’s possible to identify the mispricing of entire market segments and predict when they will turn up or down. The reality is that the vast majority of these methods fail even to match the market, let alone beat it. Unfortunately, most of the public is in this quadrant. This is because the media perpetuates such thinking as it tries to sell newspapers, magazines and website subscriptions. For the media, it’s all about getting you to return to them time and time again. Quadrant two is the conventional wisdom quadrant. It’s called this because it includes most of the financial services industry. Most investment professionals have the experience to know that they can’t predict broad market swings with any degree of accuracy. They know that making incorrect predictions usually means losing clients. However, they believe there are thousands of market analysts and portfolio managers with MBAs and high-tech information systems who can find undervalued securities and so add value for their clients. Of course, we all want to believe that if you’re bright enough and work hard enough, you will be successful in a competitive environment. After all, it works in other disciplines. Unfortunately, as irrational as it seems, in an efficient capital market this methodology, on average, adds no value. Although the debates about the efficiency of markets are still ongoing, most economists believe that, fundamentally, capital markets work well as a means of setting prices. Quadrant three is the (are you ready for this one?) 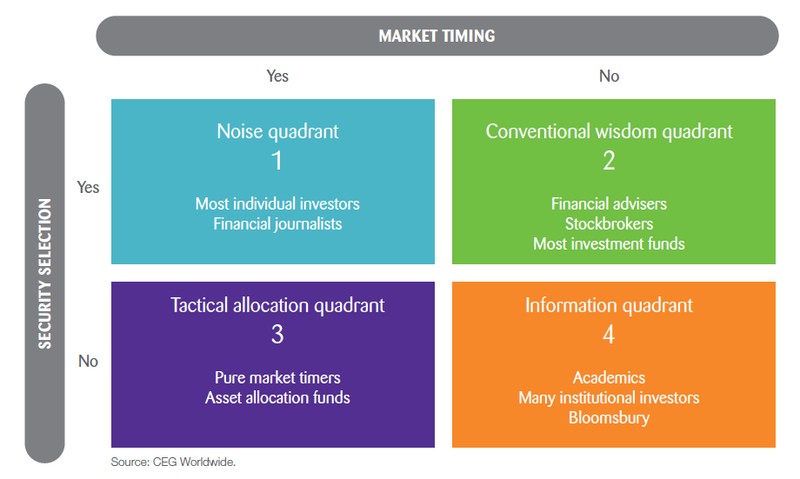 tactical asset allocation quadrant. Investors in this quadrant believe that, even though individual securities are priced efficiently, they (and only they) can see broad mispricing in entire market sectors. They think they can add value by buying when a market is undervalued, waiting until other investors finally recognise their mistake, and then selling when the market is fairly valued once again. We believe it’s inconsistent to think that individual securities are priced fairly but that the overall market, which is an aggregate of the fairly priced individual securities, is not. No prudent investors are found in this quadrant. Quadrant four is the information quadrant. This is where most of the academic community sits, along with many institutional investors. Investors in this quadrant dispassionately research what works and then follow a rational course of action based on empirical evidence. 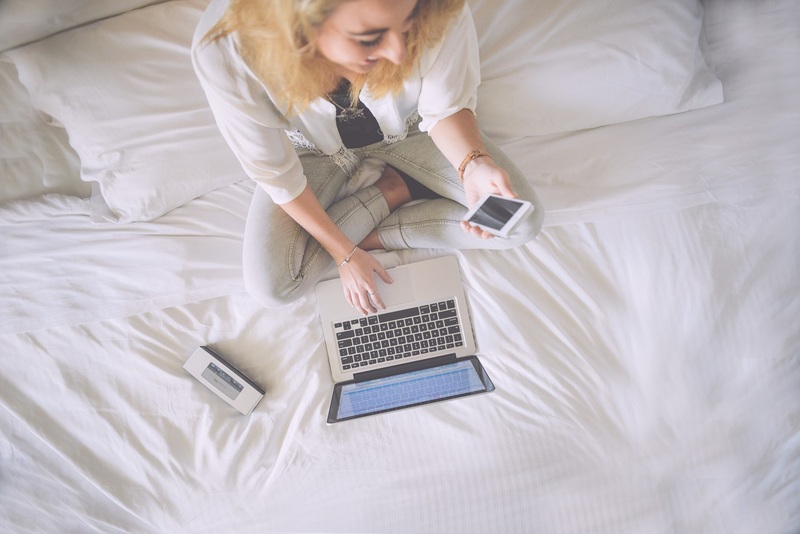 Academic studies indicate that investments in the other three quadrants, on average, do no better than the market after fees, transaction costs and taxes. Because of their lower costs, passive investments – those in quadrant four – have higher net returns on average than the other types of investments1. In this series of blogs I’ll help you to move from the noise quadrant to the information quadrant. As a result you will begin to maximise the probability of achieving your financial goals. In part two I’ll explain the first of the five key concepts for investment success. 1 Michael C. Jensen, “The performance of mutual funds in the Period 1945–1964,” Journal of Finance, May 1968; Mark M. Carhart, Jennifer N. Carpenter, Anthony W. Lynch and David K. Musto, “Mutual fund survivorship,” unpublished manuscript, September 12, 2000; Christopher R. Blake, Edwin J. Elton and Martin J. Gruber, “The performance of bond mutual funds,” The Journal of Business, 1993: 66, 371–403; Edwin J. Elton, Martin J. Gruber, Sanjiv Das and Matt Hlavka, “Efficiency with costly information: A reinterpretation of evidence from managed portfolios,” The Review of Financial Studies, 1993: 6, 1–22. Jason Butler is a Chartered Financial Planner and Investment Manager at City based Bloomsbury. He has twenty years’ experience in advising successful individuals and their families on wealth management strategies. Visit Jason’s profile at unbiased.co.uk.